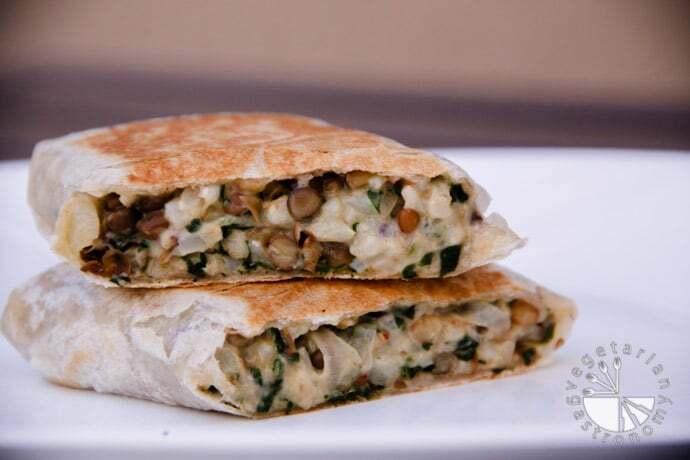 Lentils, brown rice, and spinach packed into a healthy, protein filled, tasty grilled wrap! This dish has become a monthly meal for my family. It’s relatively quick to make, healthy, and very filling! When I saw the ingredients list, I was very skeptical because it called for a mix of yogurt and mozzarella cheese. But then I thought what a great idea it was to use yogurt and cheese to bring all the other flavors and ingredients together and help create that perfect filling texture (UPDATE: I have Veganized this recipe)! If you’re looking for an alternative to a grilled burrito or fresh veggie wrap, this is the perfect meal! I was a little worried that my husband may not like this wrap because well, he’s not a huge fan of cold wraps, but even he loved the taste of this warm grilled lentil wrap! Even my 3 year old devoured it (without the hot sauce of course!). 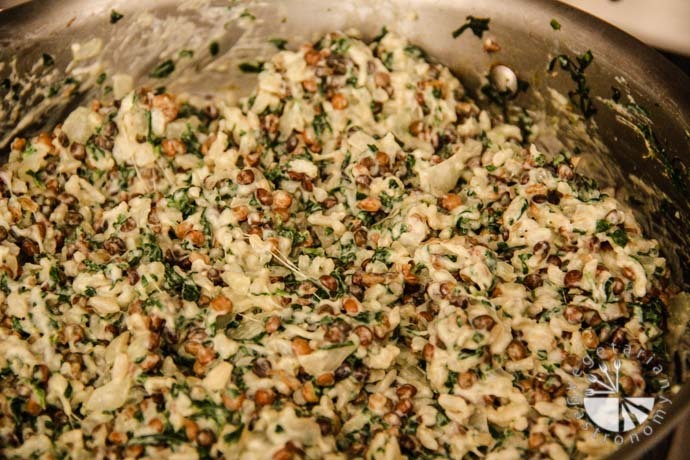 I typically make the filling ahead of time and store it in fridge. That way whenever we want to eat it the next day or two , we just microwave the filling, pull out the tortilla, and assemble and grill the wrap! Believe it or not, this recipe was adapted by the Trader Joe’s Vegetarian Cookbook! I never knew Trader Joe’s even HAD a vegetarian cookbook. They obviously feature recipes with their products inside. This recipe intrigued me because I’ve used their pre-cooked steamed lentils several times before when making vegetarian chili or Lentil Feta Brushetta Dip. So when I ran across this recipe where they used them in a grilled wrap, I knew I had to give it a try. If you have the time and prefer to cook your own lentils for this dish, used small French lentils (lentilles du Puy). 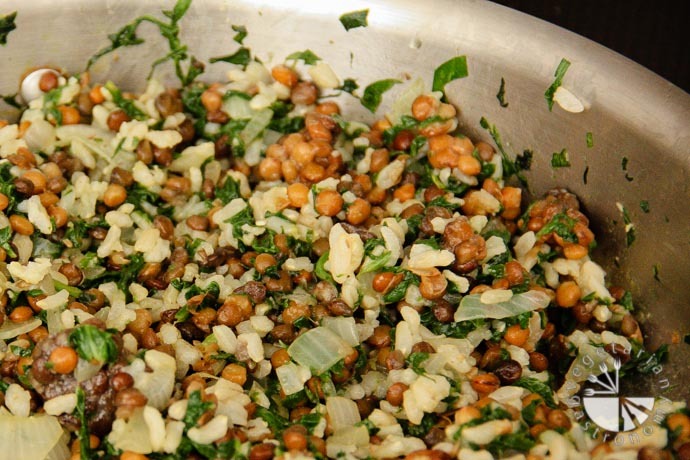 French lentils take less time to cook, retain their shape better than ordinary lentils, and are firmer in texture. They are perfect for dishes such as salads and this wrap where they need to retain their shape. You can also easily use black beans, as I have done many times. After I made the filling, I felt like it lacked some flavor or spice. So I decided to add some of my favorite hot sauce, Cholula, into the mix. I also ended up adding more lentils/beans and spinach to the mix. I of course took some of the filling out for my 3 year old before adding the hot sauce because he can’t handle the heat. But otherwise, with the addition of the hot sauce, this wrap was extremely tasty! I’ve had it with both uncooked flour tortilla and whole wheat tortilla, and they both taste great! If you haven’t tried uncooked flour tortilla yet, it’s amazing and melts in your mouth!! You can pick it up at just about any major grocery store such as Ralphs, Vons, or Sprouts. For a gluten-free option, use brown rice tortilla, just be sure to grill both sides slowly on low heat until crispy and prepare an open end wrap instead of a closed wrap. You can also grill some corn tortilla and serve as tacos. What is your favorite filling for a wrap? Heat the olive oil in a large non-stick skillet on medium heat. Add the onions and saute until they start to become translucent. 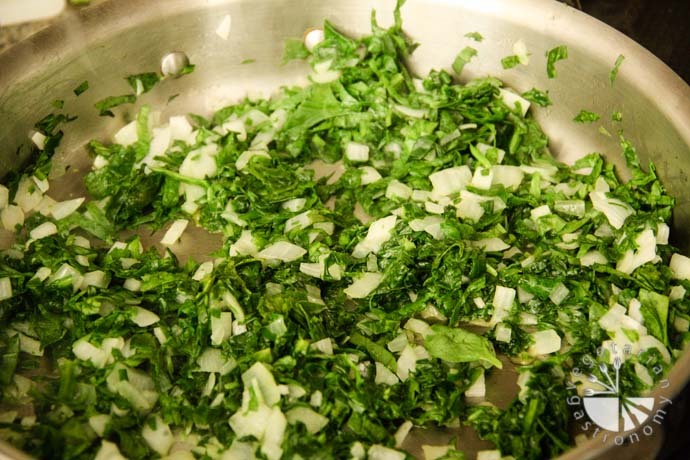 Add the chopped spinach and cook with the onions until the spinach is completely wilted, cooked through, and all the water released from the spinach has burned off. Mix frequently. Add the cooked brown rice and the steamed lentils. Mix them into the mixture until they are thoroughly combined and heated all the way through. Remove from heat and fold in the yogurt (if using) and shredded cheese (or Tofutti vegan cream cheese for vegan option). Add Cholula hot sauce (if using). Add more or less depending on your preferred level of spice/flavor. Season with salt if needed. Heat a non-stick pan on medium heat. Lightly grill one side of the tortilla with some vegan butter. Place the tortilla grilled side up on a plate. Place 2-3 large spoons (about 2/3 cup, depending on the size of your tortilla) in the center of the tortilla. Fold all 4 sides over into a burrito and place it back on the heated skillet, seam-side down. Place a heavy item such as another pot on top of the burrito to press it down (acting as a panini press). Cook on both sides for 3-5 minutes until both sides are toasted, crispy, and browned. Cut the wrap in half and serve warm with some Cholula Hot Sauce (or your favorite hot sauce). Vegan option - omit the yogurt and add some Tofutti brand vegan cream cheese into the mix to get that creamy texture and flavor. I personally prefer the Tofutti brand vegan cream cheese to others. The lentils can be cooked in a pressure cooker. If you don't have the time, you can also buy fully cooked lentils (french) at Trader Joe's or use cooked black beans, which is what I typically do when I don't have the time. If you are using Gluten-Free brown rice tortilla, you probably will not be able to wrap it up like a burrito as you can with a flour tortilla. So instead, slowly grill both sides of the brown rice tortilla (without using any butter) until the tortilla becomes crispy. Place some filling in the middle and wrap two sides over the filling. Eat as an open wrap. Alternatively you can grill some corn tortilla and enjoy them as tacos.